The British Indian Army, was officially named just the Indian Army, and was the principal army of the British Raj in India before independence in 1947. It was responsible for the defence of both directly governed British India and the Princely states (which could also have their own armies). 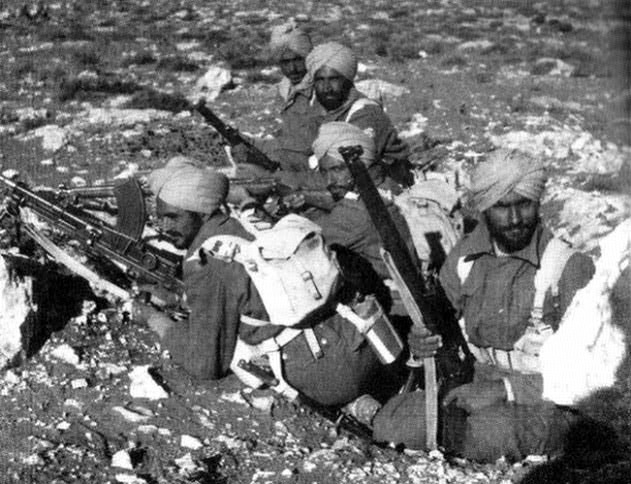 The Indian Army was an important part of the British Empire's forces, both in India and abroad, particularly during the First World War and the Second World War. The Indian Army has its origins in the years after the Indian Rebellion of 1857, often called the Indian Mutiny in British histories, when in 1858 the Crown took over direct rule of British India from the East India Company. Before 1858, the precursor units of the Indian Army were units controlled by the Company and were paid for by their profits. These operated alongside units of the British Army, funded by the British government in London. The armies of the East India Company were recruited primarily from Muslims in the Bengal Presidency, which consisted of Bengal, Bihar and Uttar Pradesh, and high caste Hindus recruited primarily from the rural plains of Oudh. Many of these troops took part in the Indian Mutiny, with the aim of reinstating the Mughal Emperor Bahadur Shah II at Delhi, partly as a result of insensitive treatment by their British officers. The officer commanding the Army of India was the Commander-in-Chief in India who reported to the civilian Governor-General of India. The title was used before the creation of a unified British Indian Army; the first holder was Major General Stringer Lawrence in 1748. By the early 1900s the Commander-in-Chief and his staff were based at GHQ India. Indian Army postings were less prestigious than British Army positions, but the pay was significantly greater so that officers could live on their salaries instead of having to have a private income. Accordingly vacancies in the Indian Army were much sought after and generally reserved for the higher placed officer-cadets graduating from the Royal Military Academy Sandhurst. British officers in the Indian Army were expected to learn to speak the Indian languages of their men, who tended to be recruited from primarily Hindi speaking areas. Prominent British Indian Army officers included Frederick Roberts, 1st Earl Roberts, William Birdwood, 1st Baron Birdwood, Claude Auchinleck and William Slim, 1st Viscount Slim. Commissioned officers, British and Indian, held identical ranks to commissioned officers of the British Army. King's Commissioned Indian Officers (KCIOs), created from the 1920s, held equal powers to British officers. Viceroy's Commissioned Officers were Indians holding officer ranks. They were treated in almost all respects as commissioned officers, but had authority over Indian troops only, and were subordinate to all British King's (and Queen's) Commissioned Officers and KCIOs. They included Subedar Major or Risaldar-Major (Cavalry), equivalents to a British Major; Subedar or Risaldar (Cavalry) equivalents to Captain; and Jemadars equivalent, to Lieutenant. In the aftermath of the Indian Rebellion, the three armies of the former Presidencies of the East India Company passed to the British crown. After the mutiny, recruitment switched to what the British called the "martial races," particularly Sikhs, Awans, Gakhars, and other Punjabi Mussulmans, Pashtuns,Marathas, Bunts, Nairs, Rajputs, Yadavs, Kumaonis, Gurkhas, Garhwalis, Mohyals, Dogras, Jats, Sainis,. The Punjab Frontier Force was under the direct control of the Lieutenant-Governor of the Punjab during peacetime until 1886, when it came under the C-in-C, India. The Hyderabad Contingent and other local corps remained under direct governmental control. Standing higher formations - divisions and brigades - were abandoned in 1889. No divisional staffs were maintained in peacetime, and troops were dispersed throughout the sub-continent, with internal security as their main function. In 1891 the three staff corps were merged into one Indian Staff Corps. 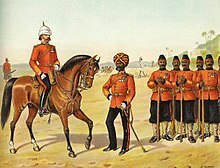 The Kitchener reforms began in 1903 when Lord Kitchener of Khartoum, newly appointed Commander-in-Chief, India, completed the unification of the three former Presidency armies, and also the Punjab Frontier Force, the Hyderabad Contingent and other local forces, into one Indian Army. 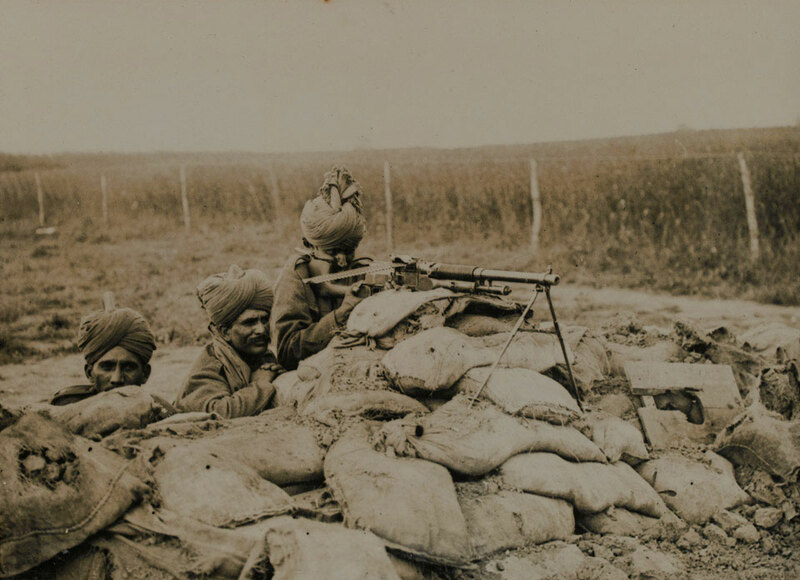 A Benet-Mercier machine gun section of 2nd Rajput Light Infantry in action in Flanders, during the winter of 1914–15. After World War I the British started the process of Indianisation by which Indians were promoted into higher officer ranks. Indian cadets were sent to study at the Royal Military Academy Sandhurst in England and were given full commissions as King's Commissioned Indian Officers. The KCIOs were equivalent in every way to British commissioned officers and had full authority over British troops (unlike VCOs). Some KCIOs were attached to British Army units for a part of their careers. In 1922, after experience had shown that the large groups of single battalion regiments were unwieldy, a number of large regiments were created, and numerous cavalry regiments amalgamated. The List of regiments of the Indian Army (1922) shows the reduced number of larger regiments. Until 1932 most British Indian Army officers, both British and Indian, were trained at Royal Military Academy Sandhurst, after that date the Indian officers increasingly received their training at the Indian Military Academy in Dehradun which was established that year. 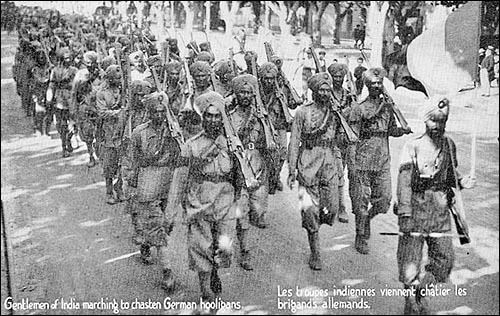 At the outbreak of the Second World War, the Indian Army numbered 205,000 men. Later on during the Second World War the Indian Army would become the largest all-volunteer force in history, rising to over 2.5 million men in size. In doing so the Indian III Corps, Indian IV Corps, Indian XV Corps, Indian XXXIII Corps, Indian XXXIV Corps, 4th, 5th, 6th, 7th, 8th, 9th, 10th, 11th, 12th, 14th, 17th, 19th, 20th, 21st, and 23rd Indian Divisions were formed, as well as other forces. Additionally two armoured divisions and an airborne division were created. In matters of administration, weapons, training, and equipment, the Indian Army had considerable independence; for example, prior to the war the Indian Army adopted the Vickers-Berthier (VB) light machine gun instead of the Bren gun of the British Army, while continuing to manufacture and issue the older SMLE No. 1 Mk III rifle during the Second World War, instead of the Lee-Enfield No.4 Mk I issued to the British Army from the middle of the war. During World War II, after the fall of Singapore and the ending of ABDACOM in early 1942, until the formation of South East Asia Command (SEAC) in August 1943 some American and Chinese units were placed under British military command. As a result of the Partition of India in 1947, the formations, units, assets and indigenous personnel of the Indian Army were divided, with two thirds of the assets being retained by the Union of India, and one third going to the new Dominion of Pakistan. Four Gurkha regiments (mostly recruited in Nepal, which was outside India), were transferred from the former Indian Army to the British Army, forming its Brigade of Gurkhas and departing for a new station in Malaya. British Army units stationed in India returned to the United Kingdom or were posted to other stations outside India and Pakistan. 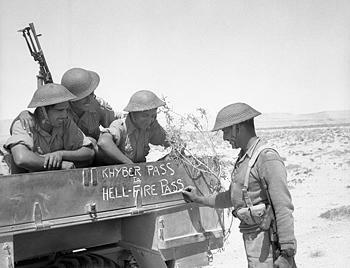 During the transition period after partition, Headquarters British Troops in India, under then Major General Lashmer Whistler, controlled the departing British units. The last British unit, 1st Battalion, Somerset Light Infantry, left on February 28, 1948. 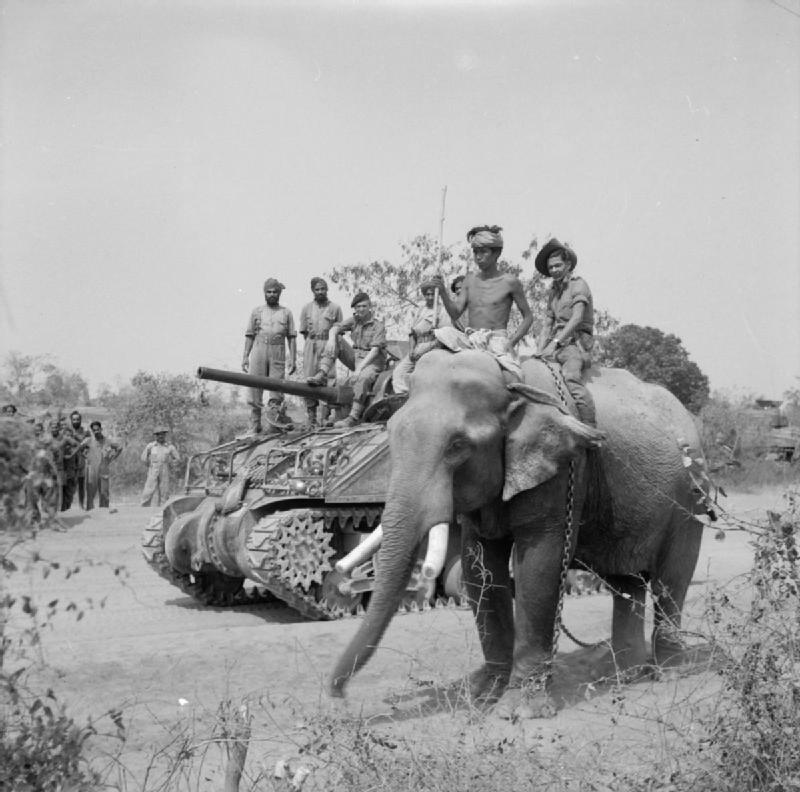 Equipment from most British units was retained by the Indian Army, as only a single infantry division, the 7th Indian Infantry Division, had been stationed in Pakistan before partition. ↑ "Southern Command History". Indianarmy.nic.in. http://indianarmy.nic.in/Site/FormTemplete/frmTempSimpleWithEightPara.aspx?MnId=Sg+FqEGS1Bo=&ParentID=Y11bXvHH2Ok=&flag=p. Retrieved 4 January 2010. ↑ "British Isles: The Isle of Man, Jersey (327)". Links.jstor.org. http://links.jstor.org/sici?sici=1479-5973%281913%292%3A13%3A2%3C327%3ABI%3E2.0.CO%3B2-O. Retrieved 2012-11-20. ↑ "Exhibitions & Learning online | First World War | Service records". The National Archives. http://www.nationalarchives.gov.uk/pathways/firstworldwar/service_records/sr_soldiers.htm. Retrieved 2012-11-20. ↑ Barua, Pradeep (2003). The Gentlemen of the Raj. Westport, CT: Praeger Publishing. ↑ 27.0 27.1 "Participants from the Indian subcontinent in the First World War". Memorial Gates Trust. http://www.mgtrust.org/ind1.htm. Retrieved 2009-09-12. Barkawi, Tarak (April 2006). "Culture and Combat In the Colonies: The Indian Army In the Second World War". Sage. pp. 325–355. Digital object identifier:10.1177/0022009406062071. http://cambridge.academia.edu/TarakBarkawi/Papers/267472/Culture_and_Combat_In_the_Colonies_The_Indian_Army_In_the_Second_World_War. Heathcote, T. A. The Indian Army - The Garrison of British Imperial India, 1822-1922. David & Charles. Newton Abbot, Devon. 1974. Smyth, Sir John (1967). Bolo Whistler: the life of General Sir Lashmer Whistler: a study in leadership. London: Muller. OCLC 59031387. Duckers, Peter (2003). The British Indian Army 1860–1914. Shire Books. ISBN 978-0-7478-0550-2. Guy, Alan J.; Boyden, Peter B. (1997). Soldiers of the Raj, The Indian Army 1600–1947. National Army Museum Chelsea.